This rubber bracelet is white and on that white you can see blue squares and in those square you can find Doctor Who. 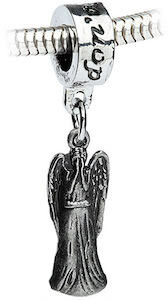 And not just one Doctor no many of the Doctor’s that where there in the 50 years Doctor Who was with us already. And besides the silhouettes of the Doctor’s there is one that shows a special Tardis that has a big 50 on it for the 50th anniversary. 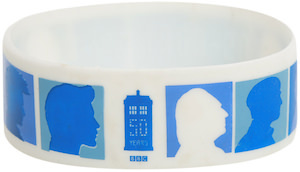 A rubber bracelet like this is a fun thing to wear that makes it clear to the world that you are a big Doctor Who fan.